Why won't Budget Direct insure me? Put your risk factor to the test on Captain Risky's Commando Course! A series of risktastic obstacles coming to a l… https://t.co/HSOE2fPqaH | 🎅 Riskmas Cracker #12: What do you call a cat in the desert? Sandy claws! | 🎅 Riskmas Cracker #11: Why do birds fly south for the winter? Because it’s too far to walk. | 🎅 Riskmas Cracker #10: Why couldn’t the skeleton go to the Christmas party? Because he had no body to go with. | 🎅 Riskmas Cracker #09: What do you call a short-sighted dinosaur? A do-you-think-he-saw-us | 🎅Riskmas Cracker #08: What do you get when you cross a sheep with a kangaroo? A woolie jumper | 🎅 Riskmas Cracker #07: Why are pirates called pirates? Because they arrrrrrr! | 🎅Riskmas Cracker #06 Why are Christmas trees very bad at knitting? Because they always drop their needles. | 🎅Riskmas Cracker #05: What carol is heard in the desert? O camel ye faithful. Shhh ...time for some secret time. 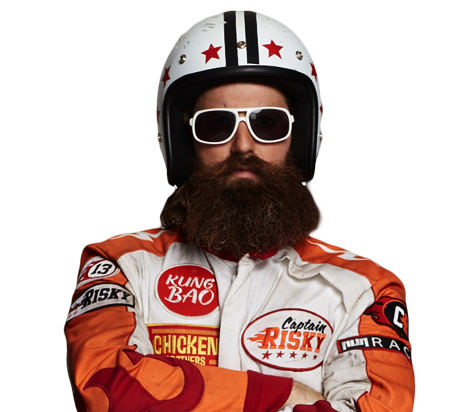 "Captain Risky" is a registered Trademark of Auto & General Services Pty Ltd (ABN 61 003 617 909, AFSL 241 411). © 2015 Auto & General Services Pty Ltd. All rights reserved.